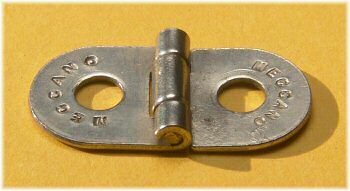 The Meccano hinge is a little-used part, as it was only ever supplied in a pair in the very largest outfits. Although it appears in the Meccano Magazine of March/April 1921 under "New Meccano Parts", these lists can be a year or more out of date. The hinge doesn't appear in the December 1919 parts listing (which only goes to part 113), but makes its first appearance in the 1920 manual along with parts up to 122. A remarkably unchanged little part, this one. It appears to have had no change in its form since production started, and has only existed in four different finishes. But we have stumbled upon yet more variations in our search for photographs. The picture to the right shows some of the sequence of events. 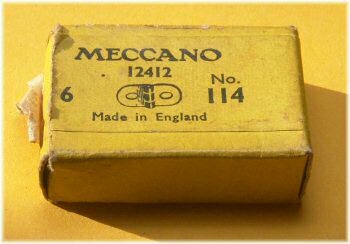 The first example is a pre-war version, probably from the 1930's, stamped Meccano. Next to this is the blackened steel "Korean" part, obviously datable to 1951/52. Both of these have exactly a half-inch spacing between holes when arranged like this. Unstamped nickel post-war hinges are also mostly this size, but a small number are significantly longer, as with the middle example in the photograph. The hole spacing is about 9/16'', or about 2mm greater than the 'standard' half-inch spacing. It's particularly clear in the photographto the left, provided by John Nuttall, where the parts are placed over the holes in a flat plate. 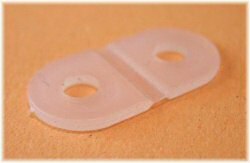 The parts appear to be made from similar or identical stampings, the difference is in the position of the curved section. The longer variety are generally looser. Only a small number of these exist in nickel plate, dating this change to the early 60s (perhaps 1962, when many parts changed?). Next to this is the identical zinc plated version, this particular one is from a mint 1972 outfit and thus can be clearly dated. At the far right of the photograph above is a late 70's smaller version of the hinge – less than half an inch spacing, again by almost 2mm. 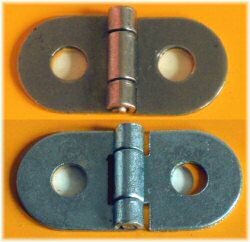 These shorter zinc-plated hinges can also be found in the 1985-92 outfits from Meccano SA in France that were supplied to the UK. The photo to the right shows the comparison between a pre-war half-inch hinge and a post-Binns Road short hinge. William Irwin believes that this shorter hinge is also of Binns Road production. We need to measure up some matt brass 1978/79 versions to see whether we can find some variation there. Possibly a prototype plastic hinge? The picture to the right shows a box of six hinges in a spare parts box, dating anywhere from the mid-50's through to the early 60's. The box and label are unchanged during this period for uncoloured (nickel plated) parts. You can usually find hinges for sale on EBAY - there are several on right now. The modern Meccano Sopwith Camel set has four I think. would you know where I can buy these hinges, I'm after 10 of these? Thanks. I have a model on the go which uses over 200 of them!! I'm not sure why these should be little used parts. Whenever I have a gear box or such like in a model I try to cover it with a hinged lid fasted either to a hinged flat plate or a pair of hinges. Saves a lot of bother when the works go wrong or need adjustment. 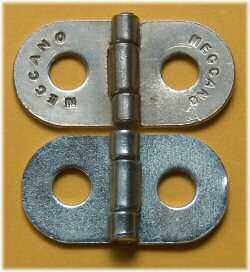 I have a pair of these in nickel stamped MECCANO on one leaf and FABRIQUE EN ANGLETERRE on the other, with the 1/2" spacing. They appear to come from a set 6a which dates from c.1927. I don't currently have access to a digital camera, and presumably I'd need a good macro capability to capture the stampings (any advice? ), but if you really want to get into the stamping distinctions for this part I'll see what I can do.